The Compound Interest service allows you to payout interest on your users points balances. Interest is compounded daily and you can select if you want to payout weekly, monthly, quarterly or annually. 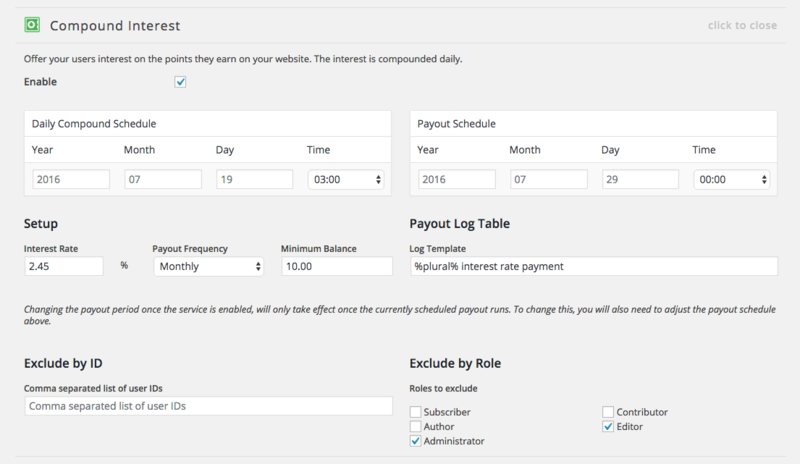 You can set the interest rate both globally and individually for each user. You can also select if users must have a minimum amount of points for interest to compound on their account and select which users to exclude based on user ID or by role. When you enable the add-on for the first time, we are required to set when you want to start compounding interest on accounts. This is done by setting the year, month, day and hour and of course it must be in the future and not in the past. Once started, you will see the date for the next schedule faded in the table. You can at any time, change this by entering in a new year, month, day and time. Even if you only want to change one field, all fields must be filled out! You can select to payout daily, weekly, monthly, quarterly, biannually or annually. To enable this add-on you must set the first payout date and based on your “Payout Frequency” settings, the service will schedule the next one once it completes the first one. Do not schedule payout to run on the same hour as the compound schedule! Preferably, the compounding should run before payout, both running at the same time will result in incorrect payouts. Just like the Daily Compound Schedule, you can change the payout schedule at any time.